I have always been (and always will be) a jeans-and-t-shirt kind of girl. Don't get me wrong, I love clothes. I eat, sleep, and breathe fashion, but at the end- and beginning- of the day, comfort always comes first. However, there's a major downside to always dressing casually- you always look the same! So what's the solution for someone like me, who rocks the same basics 5 out of 7 days a week? SCARVES! Okay, well, accessories in general work, but scarves are my favorite. They're versatile, they come in all colors and prints, they're super comfy, and they come in handy in public places when you need to cover your nose and mouth from funny smells (random, but SO true). Since I'll soon have to pack up my various chunky, cable-knit options... here are my picks for spring scarves. 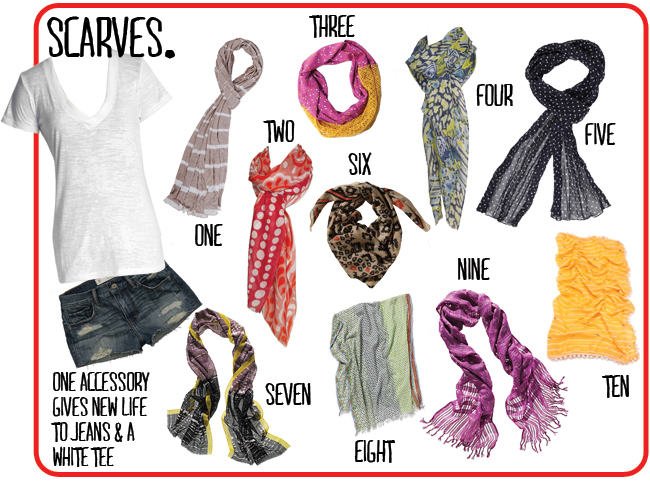 Love, love, love these spring scarves! I'm excited too to break out my spring scarves! I like #4, love the print! oooh! great link, thanks! I love #4 too :-) Actually, I love them all!